In efforts to help individuals, businesses, agencies and other organizations count down to the planned partial daytime and full nighttime closures of the northbound I-405 freeway in the Sepulveda Pass Presidents’ Day Weekend Feb. 14-18, Metro has created an official online countdown clock and banner ads that are freely available for public use here. The online clock counts down the number of days, hours, minutes and seconds before the anticipated 80-hour northbound I-405 paving operation between Getty Center Drive and Ventura Boulevard officially begins. On Friday night, February 14, ramps along the 5.6-mile closure area will begin to be shut down as early as 7 p.m., and closure of freeway lanes will begin at 11 p.m. to ensure full freeway closure by 1 a.m. The operation and related daytime/nighttime lane closures will continue until 6 a.m. Tuesday morning, February 18. For specific information on the operation, click here. The clock and banner ad will remain live on Metro’s home page at metro.net and project page to serve as a constant, urgent reminder advising motorists to “Avoid Delays, Reduce Driving or Stay Away” to avoid potentially significant congestion and multi-hour delays. 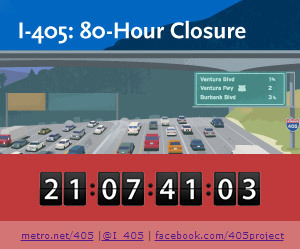 A selection of “I-405: 80-Hour Closure” banner ads in various sizes and options can also be used to help raise public awareness as much as possible. The web page provides code enabling webmasters to easily add the clock and banner graphics to their web sites.